Candidates age limit should be 18 to 40/ 45 years for Post 1, 20 – 36 years for Post 2, 24 – 32 years for Post 3 as on 01-03-2019. Age relaxation is applicable to SC/ ST/ OBC/ Person with disabilities (PWD)/ Ex-Servicemen as per rules. Candidates should possess Graduation with first class in any stream from a recognized University for Post 1, Graduation in B.Sc Agri or Veterinary Science or in any allied courses in Agri from a recognized University or Graduation in any discipline from a recognized University with Post Graduate qualification as M. Tech. Agri or MBAAgri or M.Sc in relevant discipline for Post 2, Graduation in Law from any recognized University/ Institution for post 3 with relevant experience. Candidates will be selected based on group discussion & personnel interview for Post 1, online written test, personnel interview for post 2, 3. Candidates should pay Rs. 150/- (Intimation Charges) for SC/ ST/ PWD candidates and Rs. 700/- (Application fee + Intimation Charges) for all other candidates through online by using Debit Cards (RuPay/ Visa/ MasterCard/ Maestro), Credit Cards, Internet Banking, IMPS, Cash Cards/ Mobile Wallets. Eligible candidates may apply online through the website www.idbi.com. Starting Date to Apply Online & Payment of Fee: Link will be made live shortly. Last Date to Apply Online & Payment of Fee: Link will be made live shortly. Date of Online Test at all centers: Link will be made live shortly. 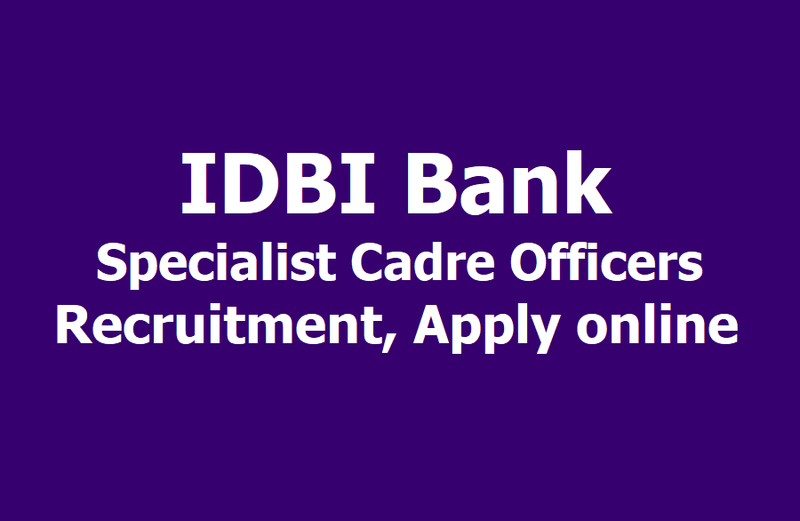 IDBI Bank has announced recruitment of Specialist Cadre Officers 2019. The application process will begin shortly and the link will be shared on the official website. The bank has also released the detailed advertisement on the official website. Candidates can check the detailed advertisement for eligibility criteria, age limit, exam pattern etc. There are total 120 vacancies available. The details of the reservation for GM , DGM, AGM and Manager are available on the official website. Out of the 120 vacancies, 71 are for gneral category candidates, 6 for SC, 7 for ST, 30 for OBC, 6 for EWS, and 3 for PwD category candidates. The selection process for the above post will comprise of preliminary screening based on the eligibility criteria, candidate's qualifications, experience, etc. submitted online. Only such candidates will be called for Group Discussion (GD) and/ or Personnel Interview (PI). IDBI SO Recruitment 2019: How to Apply? Step one: Go to the careers portal on the official IDBI website: www.idbi.com/idbi-bank-careers. Step two: Click on the current opening on the top left corner of the page. Step three: Read the official notification carefully and go to the fourth option. Step four: Before applying you can read the eligibility and the other categories for the application. The link for the online application and the payment of fees will be uploaded shortly. The application fee for SC, ST and PWD is Rs. 150 and for all others is Rs.700.